She’s a doting mother to five-month-old baby daughter Patricia with football manager husband Frank Lampard. But Christine Lampard made time for the other subject of her affection as she lavished her pet pooch Minnie with hugs while enjoying a stroll in her local London park on Monday morning. The TV presenter, 40, showed off her svelte figure in form-fitting workout leggings, teamed with a turquoise jumper. The Loose Women panellist kept warm in a padded black jacket and finished off the look with pink and grey Nike trainers. The mother-of-one scraped her hair back into a casual ponytail and toted her belongings in a large holdall. Christine gave her pooch Minnie the most of her attention as she carried the pup and bestowed on her plenty of cuddles. The television personality’s outing comes after she stood in for Lorraine Kelly on her eponymous talk show during half term week and reflected on the emotional moments leading up to her daughter’s birth. She said: ‘The doctor, just before the big moment, said you’re about to become a mummy and that’s when the tears started. Christine also spoke about her experience giving birth, adding: ‘It wasn’t too bad. ‘It was what it was supposed to be, she thankfully was healthy and happy and you heard the little scream’. 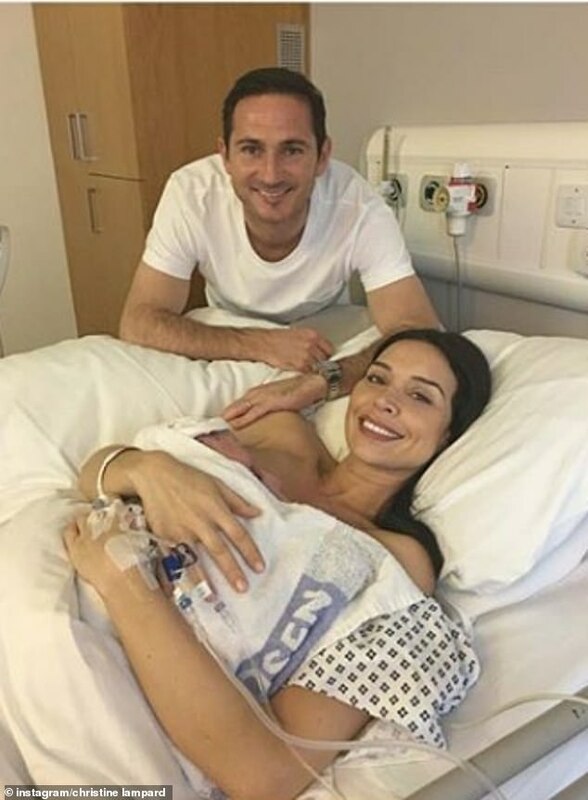 The TV star and her Derby County manager husband, 40, welcomed baby Patricia into the world in September. The name Patricia Charlotte is a tribute to Frank’s late mother Pat, who passed away in 2008 aged 58 after a battle with pneumonia. Christine and Frank met at the Pride of Britain Awards in 2009 and married in Knightsbridge, London, in December 2015 after a four-year engagement.